Born and brought up in India. When I came in to my senses. I was able to see strange figures in surroundings. Whenever I told this to my mom. She used to laugh at me and always said you are day dreaming. But my grandfather used to smile at me and when I was 8 years old, he told me he knew various types of magic but he stopped practicing after his marriage and have only done healings since then. He learned those secret mantras from a group of Naath Yogies when he was a teen.. He helped me learn few of those.. I was always able to see dead people ever since I was 10 years old. 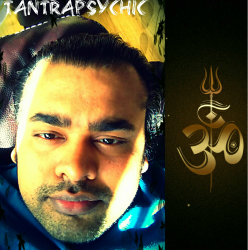 My journey in to the field of Tantra started at the age of 14 years. At the age of 16, I was attacked by a demon while I was sleeping in a haunted house of relatives, by that time I was following Tantra and saved myself by mantra power. Since then I have never looked back and I kept trying new Dhyan yoga, mantra and Tantra Sadhnas procedures. I started developing some powers of remote vision and I found that I am able to tell a lot of things about any unknown person by just gazing on his/her photograph and everything I would say comes out to be true. & to meet other people following Indian Tantra, to discuss different rituals and to help others. I have helped a lot of people since then, with the help of my psychic powers. I went to Haridwar during Mahakumbh in 2009. There I had a holy dip in Ganges. After I came back, I started a Aprsara( fairy) sadhna/ritual for 21 days . I got success in it and after few days of completion of this Sadhna. My guru/ spirit guide/ my deity Baba Birfa Naath Ji who is disciple of Guru Gorakh Naath Ji came in to my conscious and accepted me as his pupil. Ever since then I am following Naath Panth one of the strongest and most ancient paths of Indian Tantra and my powers are increasing day by day. In winter 2010 i was attacked by a Aghori by his powers. He attacked me out of jealousy. He sent 3 Tantra powers to attack me one after the other but my guru saved me and still I was not angry at him at all . As I believe god forgive those who forgive others. But attacks after attacks on me made my guru very angry. He gave me 3 choices of Astra (very powerful spiritual weapons of destruction) and my guru said he will use one of these on that Aghori. I requested my guru to destroy his ego not him. Same day after my guru (my guide) attacked that Aghori all his powers got destroyed and it affected his health. Next day his community and ids were deleted never heard a single word from him ever again. Until summer 2014 when he apologized and asked to accept his friendship. This is the power of Naath Panth which I follow. My guru picked me after I did 15 years of Tantra practice and Sadhnas. You can use the button above to support my website and blog financially.